Well yes, you, too. But this card was made for my husband. Sure, I tell my husband regularly how awesome I know he is, but there's something about taking the time to write it down and letting a person read your grateful thoughts that makes it official. And memorable. I know you were excited to see all the sneak peeks you found there! 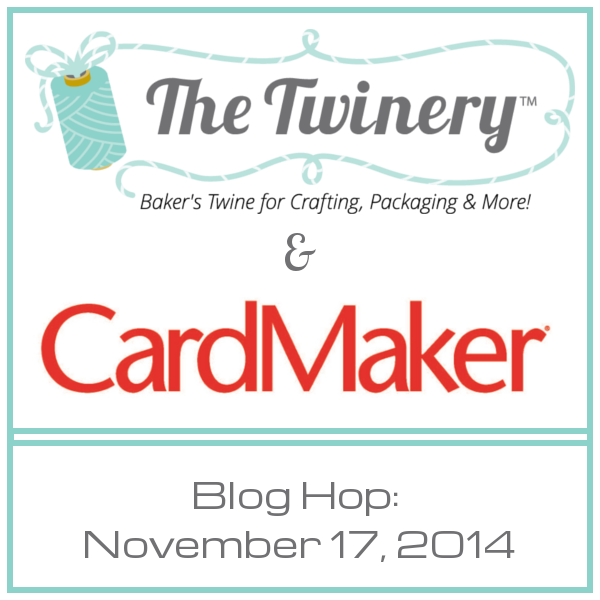 If you haven't already, you may want to begin the blog hop with CardMaker magazine so you don't miss out on tons of great cards and inspiration along the way. I've worked outside the box here on what one might consider traditional Fall color combinations, but after I wrapped by card with the Gold Shimmer baker's twine, I felt it needed a pop. So, diving into my basket full of twine goodness, I chose the Solid Denim twine. 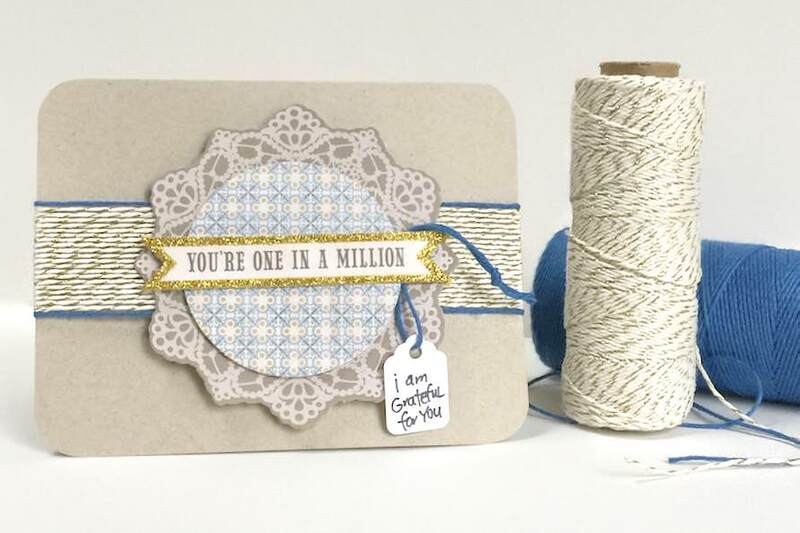 It seems to ground the shimmer twine and draw your eye in toward the "one in a million" message. I kinda love the way my threaded mini tag turned out. That was totally last minute and I think it's the my most favorite part of the card design. But then I am a fan of using your own handwriting in projects, it seems to lend authenticity and a real "handmade with love" touch! 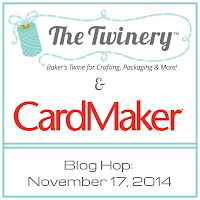 Want to win some Gold Shimmer baker's twine of your own? And Solid Mandarin, Copper Shimmer and Solid Maraschino? Just leave a comment below and on every other blog participating for even more chances to win. Very pretty! Thanks for being a part of the hop! I love your little (last minute tag) it's so sweet! 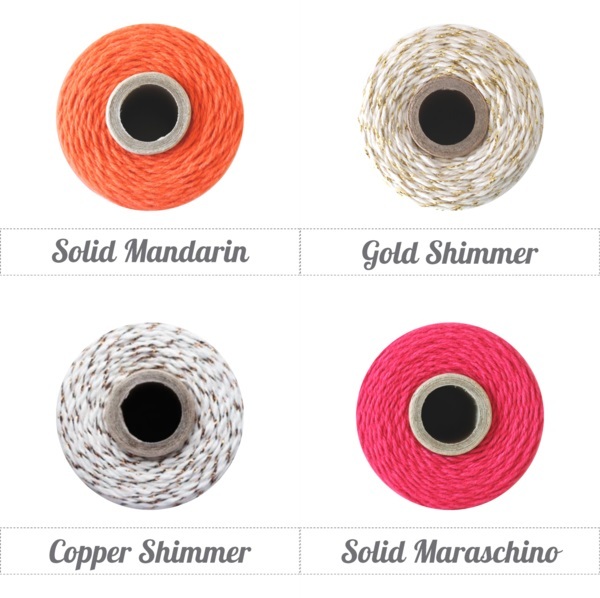 The wrapped shimmer twine looks AWESOME!!! TFS!!! Very cute card!! Love the twine rap. The card is so pretty. Love the way you wrapped the twine around and edged it with the blue. Wonderful card. I like the addition of the solid denim twine. So pretty ! 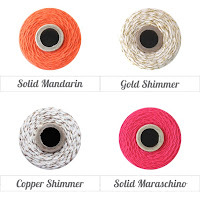 The gold shimmer twine is so pretty bordered with the solid blue!! That perfect bit of sparkle that just makes me happy! Absolutely beautiful. I love how you wrapped the gold shimmer twine around the card. I also love the handwritten message on the tag. That is a nice touch. Love the blue border, and how you used the blue to highlight the tag - too cute!! Wonderful, love the colors, the way the twine is wrapped around and the handwritten words. TFS. Love the use of the twine to make that strip. A great idea. love the way you wrapped your card with the golden/bone twine! Great job, love the twine with the colors of the card. TFS. I love the color that you use! your card is so beautiful!